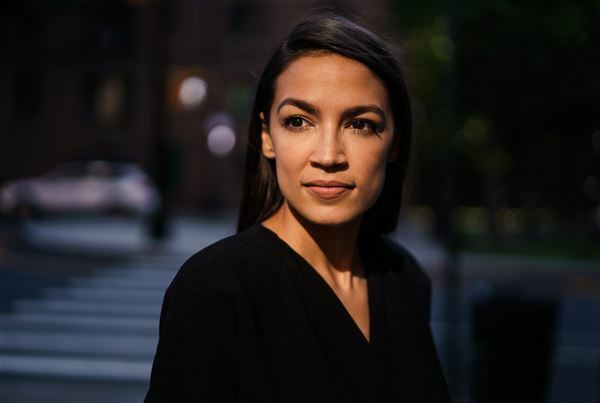 28 year-old Alexandria Ocasio-Cortez defeated 4th ranking and established House Democrat, Rep. Joe Crowley in the New York House Democratic primary last week, saying that leftist policies can win elections. First-term Illinois’s Democratic senator, Tammy Duckworth disagreed, arguing that, while it may be the future of the Bronx, running on policies too far to the left would not work in the Midwest, she said on CNN’s State of the Union. Alexandria Ocasio-Cortez ran as democratic socialist, leaving conservatives and Fox political pundits with the same stale critiques of socialism, and hence dumbfounded as to what democratic socialism is, what the Justice Democrat movement wants, and mixed-economies. Kyle Kulinski eats into Alex Jones and the Right on this smearing of Ocasia-Cortez as being way in over their heads. Kulinski reveals, that he was the one that wrote the original Justice Democrat platform; and that they are for social democracy, populist leftism, libertarian-leftism, and are pro-capitalist. Dave Brat (R), Virginian Congressman had badly compared Alexandria Ocasio-Cortez’s policies to the Soviet Union. At a Socialist vs. Republican debate at DePaul University a year or so ago, one would have witnessed, as I did, the end recruitment call to tables, in which after, nearly all the students went to the socialist table. The days in the United States when socialism was a negative term, is dead, as it died in Europe; and young students are open to the ideas that democratic socialism and social democrats offer them. They claim to be the “true populists,” precisely because their policies are favorable to both political demographics. The key for both political parties is convincing the working class. President Donald Trump, who began to adopt aspects of the platform expressed by Sen. Bernie Sanders, back in 2016 claimed, that under his influence, the Republican Party would become a broad populist coalition focused on workers, hence, a Workers’ Party. I could not help, but be reminded of semblances to the era of Nazi Germany, being a scout about Fascist ideologies and the history of the National Socialist party under Adolf Hitler; so I dug up William L. Shirer’s The Rise and Fall of the Third Reich, as well as some research on Fascism and Conservatism, that William L. Shirer covered. Since, I write about the history of Classical and Neo-Republicanism (i.e., the Ideological Roots of the American Revolution), I cannot help but be curious as to why American Party Politics has a Conservativism at all and even worst in our times, a reactionary infestation within that American-style Conservatism; since the history and ideology is telling me, that the American Union is basically in truth (and in ideal) — a Sister-Brotherhood, an Association, a Fraternity, a Coalition of Revolutionaries of the Left; and that this same ideology is not Anti-Communitarian nor extremely Individualist; and neither is it inherently Anti-Socialist, or vehemently (religiously) Anti-Socialist. We find that it could be better, than what our current Parties express, respectively. The Party ideologies have shifted and changed in policy, and are merely schisms of schisms, but its PARENT, the inspiration of the American founders’ derives from things we study and idealize — Ancient Nations, Classical Philosophers and Republicanism. History also tells us, that conservatism, or the Right, was the same fundamentally (who its policies benefited the most) in the 18th century as they are now this minute in the United States. President Trump’s aim to make the Republican Party a workers’ party, and make grandiose gestures in support of the Army and nationalist conservatives, was exactly what Adolf Hitler promised to the German workers, and impressed on the Army, Marshals, and nationalist conservatives. Hitler masterfully played to the sympathies of the Old Order conservatives, but the co-ordination of the Reich depended on the fact Hitler acquired power, because of the conservative political elites. The same situation occurred in Italy during the saga of Benito Mussolini and Victor Emmanuel III’s short-lived diarchy of King and Duce. Mussolini, being hailed early by the Kingdom of Italy and the Catholic Church as “the man who gave God back to Italy and Italy back to God,” mirrors the clamoring-praise of the Religious Right in our country during Trump’s victory; and who further revealed after the move of the U.S. Embassy to Israel, that many of them view Donald Trump as a Prophet fulfilling Biblical prophecy. The conservative political powers in Italy and Germany aided Mussolini and Hitler to legitimate authority and legal power, because they hoped they could use them to halt the growth of radical socialism, anarchists, and republicanism. This would restore their idea of the “social order,” create the necessary conditions to get rid of the fascists with it, and return to power; and lastly to re-establish their vision of the political rule of traditional conservative elites and the dominance of private enterprise. This latter is exactly the stereotype about the American Right, and the Republican Party in the United States, and characterizes their actions, even as the “anti-establishment” President Trump leads them. The Republican Party is now, “the Party of Trump,” as Republicans and the Alt-Right went on periodical cycles of purges, letting voters know, it is his party, and the prerogative is simply, ‘loyalty to President Trump.’ Fascist ideologies and movements are partly defined by what they’re against, and this regards the ‘Anti-Liberalism’ of American Conservatives, more vehement and pronounced than before Trump’s election campaign. Conservativism, and being a “Republican,” now means being rabidly anti-liberal, anti-leftist, and a slew of other emotionally-charged things, but that existed there before Donald Trump was elected to one of the highest offices of power in the world. The popular faces of the American right have conditioned Americans with the exact thinking and rationale Trump gives legitimacy to for over a decade, and now they are adopting traditional conservatism, reactionary Dark Enlightenment thought, positive (magical) thinking (“memeing Trump into office”), Fourth Political Theory (Duginists) and Russian nationalist traditionalism, and so forth — all while claiming “the demonic Left,” and the Press are the enemies. The American Republicans are not REPUBLICANS (who stood on the other side of the pro-monarchist conservatives of France and England) in the only sense it meant, and cowardly its leader and votaries play to their old stale talking points and the base, more than they’re willing to denounce far-right thinking and logic (denying such excuse of denunciation to other races and Muslims), as much as the President so fervently rails against the American Press. CNN’s Chris Cuomo questioned Rep. Steve King (R-IA) about retweeting a message from a self-described Nazi sympathizer who had expressed admiration for Adolf Hitler, and he doubled-down. Mr. Trump already explained the reason he repeatedly denounces the media and journalists — the only people holding him accountable and tallying his lies because conservatives won’t do it — in Lesley Stahl: President Trump’s admitted tactic to “discredit” Press, and Cenk Uygur defends True Journalism. I cannot keep up with the flurry of lies Trump keeps adding by the day — a lie as simple to fact-check, at his rally in Montana, he stated to an exuberant crowd, that Ronald Reagan did not win Wisconsin when he ran, but Trump was the last Republican to win Wisconsin since Dwight Eisenhower, and he says this like it is nothing. Like, he is absolutely right. Yet, Ronald Reagan won Wisconsin both times he ran. All of this behavior gives us a warning, not about Democratic Socialism, or Ocasia-Cortez, as right intellectuals and publishers are doing. The Trump administration is lying to the U.N. it has disrespected several times about the poverty in this country (The U.N. says 18.5 million Americans are in ‘extreme poverty.’ Trump’s team says just 250,000 are); the Trump tax cuts carry a big price tag (Huge debt and risk of another financial crisis, according to the nonpartisan Congressional Budget Office); he’s scaring his base and lying about the Democrats and Democratic Socialists wanting Open Borders (No, Democrats Don’t Want ‘Open Borders’) and a Trump administration appointee to the State Department tore into standard UN documents that condemn racism as a threat to democracy. Milo Yiannopoulos, after suggesting journalists should be gunned down faced high backlash, following the Capital Gazette Shooting. Milo’s reaction was to Maxine Water’s call for protest — who is being highly disrespected and shunned by Nancy Pelosi and other top Democrats — against the Trump Cabinet, not Republicans and Trump supporters. Conservative media spun false propaganda throughout the week before the shooting, that Maxine Waters called for the murder of, and violence against Trump supporters on Capitol Hill, when she didn’t. The issue with Fake news sharing in US is a rightwing thing (6 Feb. 2018), says University of Oxford project study or Newsweek’s Liberals don’t share or believe fake news as much as Rightwingers. Donald Trump made 100 false claims for second consecutive week (July 6, 2018), and never do the rightwing media sources check anything. It is the real journalists doing all the necessary work. Concerning the separation of families yet to be reunited, and the attack on journalists, Trump’s rhetoric should have been held more to the fire by the right, if they were not so blindly conned by this man. Donald Trump, during his campaign, as said, stole the working middle class message of the Democratic Socialist, Bernie Sanders, just as Hillary Clinton incorporated his populist appeal into her message. Yet, President Trump’s policies in the long-run are not due to help the working class and re-build the middle-class, or better yet, the “white working class,” because he’s lining the pockets of share-holders.